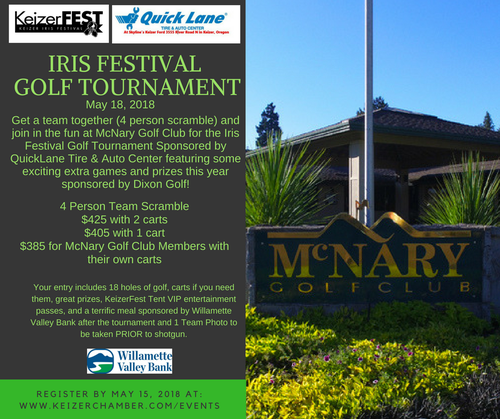 Get a team together (4 person scramble) and join in the fun at McNary Golf Club for the Iris Festival Golf Tournament Sponsored by QuickLane Tire & Auto Center! Your entry includes 18 holes of golf, chances to play for amazing prizes from Dixon Golf, the use of carts if you need them, great prizes, KeizerFest Tent VIP entertainment passes, and a terrific meal sponsored by Willamette Valley Bank after the tournament. Register by May 11th! You can also support the Keizer Chamber while promoting your business with an Executive Hole Sponsorship for $300 or a Standard Hole Sponsorship for $100, but HURRY! These opportunities are limited!